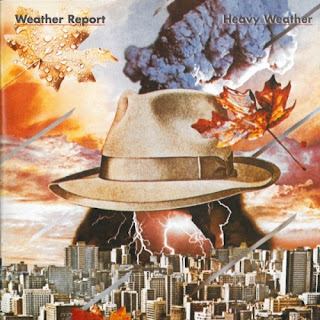 At the start of this series I mentioned my discovery of the jazzier side of music through Phil Collins' involvement with Brand X, but 1977 also saw the arrival of a classic of the genre: Weather Report's seventh studio album, 'Heavy Weather'. The band had been through some line-up changes over the years, with the constant presence of Joe Zawinul and Wayne Shorter, but now they were graced by the genius that was Jaco Pastorius on bass, alongside Alex Acuña on drums and Manolo Badrena on percussion. What drew me, and I have no doubt many others, to this album was the opening track and single, 'Birdland'. A wonderful, up-beat, joyful tune, penned by Zawinul to celebrate the NY club of the same name where he met so many jazz legends, with bass, saxophone & keys interplaying with each other throughout. A true classic! Next is 'A Remark You Made', a slower offering, but one with such depth and romance, and Pastorius's fretless bass really singing alongside Shorter's tenor sax, before ending with almost birdsong from the keys. Then comes Pastorius's composition, 'Teen Town', a short but lively tune, bass-heavy, but melodic, where Pastorius takes over the drum stool as well as the bass. Side One closes with Shorter's 'Harlequin', which is a wonderfully gentle ensemble piece with no-one dominating and each demonstrating their individual talents. There are points in this song that draw me to the Brand X sound quite a bit, despite the sax. Side Two begins with a slightly different feel, with a percussion & vocal duet between Acuña & Badrena - 'Rumba Mama' - with a strong Latin rhythm to it, which was recorded live in Montreux in 1976: pleasant enough. Then 'Palladium', which almost explodes with its staccato opening, before settling down to a syncopated rhythm on bass under a more conventional sax tune, and the added treat of steel drums included near the end by Jaco. 'The Juggler' is a more ponderous tune, but not in a bad way, with the music building in layers throughout and having an engaging waltz time to it. The album ends with 'Havona', with skittering bass, staccato drums & keys and lilting saxophones - possibly the 'jazziest' tune on the album, and more reminders for me of Brand X. Over the intervening years, since I first encountered this band and this album, my appreciation of the world of jazz and fusion music has grown, and listening again to it makes me appreciate even more the depth that this album has. It's been said many times, but this is a timeless classic, to my mind, and repays revisiting regularly!